Home » Food and Nutrition » Ketogenic Diet vs. Paleo Diet: What Are the Differences? Diets plans have existed for a long time, with people choosing to diet for a variety of reasons. Some dieters focus on weight loss; for others, a “diet” is simply an everyday lifestyle to maintain good health. The Paleo diet and ketogenic diet are trendy weight loss diets that have surged in popularity over the last decade or more. However, other benefits of these plans may include reducing inflammation, boosting immunity and mental clarity, and decreasing the risk of chronic diseases like diabetes, heart disease, and even cancer. The ketogenic diet and Paleo diet have overlapping principles. That being said, a Paleo diet is not a ketogenic diet. It is important to understand each diet, and how it will impact your short-term and long-term health goals. This article will discuss their similarities and differences to help you decide what diet will work for you. The ketogenic diet is a very low-carb diet. The Atkins diet is one of the more popular variations, but it does allow for a little more carbs. The ketogenic diet is also called the keto diet, non-carb diet, or very low carbohydrate ketogenic diet. Johns Hopkins Medical Center researchers first designed the ketogenic diet in the 1920s as a treatment for patients with epilepsy. The research team found that avoiding foods for brief periods, including carbs, helped reduce the amount of seizures while also having positive effects on hunger levels, body fat, cholesterol, and blood sugar. So, the ketogenic diet was born to mimic the benefits of fasting through the elimination of glucose found in carbohydrate foods. The term “keto” is short for ketosis. The ketogenic diet puts the body into the metabolic state of “ketosis” that occurs when the majority of the body’s energy comes from ketone bodies in the blood instead of glucose, i.e. sugar. People often enter ketosis three to four days after fasting, or after a very low-carb diet that forces the body to burn fat for energy rather than carbs. In this process many people lose a lot of body fat, despite consuming a lot of calories and fat. What’s Included on the Keto Diet? Meats, poultry, fish, dairy, eggs, moderate nuts and seeds, non-starchy vegetables, and healthy fats like coconut oil, olive oil, or avocado. Sweet vegetables and tubers, grains, high-carb dairy, fruit, and processed foods. It is important to mention that children following a strict ketogenic diet should be closely monitored. Also, people taking medications or with an existing condition like diabetes or hypertension should use caution. Healthy adults are safe to follow a very-low carb diet; however, they are advised to watch for warning signs like chronic fatigue or brain fog lasting over a week. Ketosis can also lead to muscle loss. The diet also doesn’t restrict the type of animal products, which may contain antibiotics, steroids, preservatives, and other fillers. 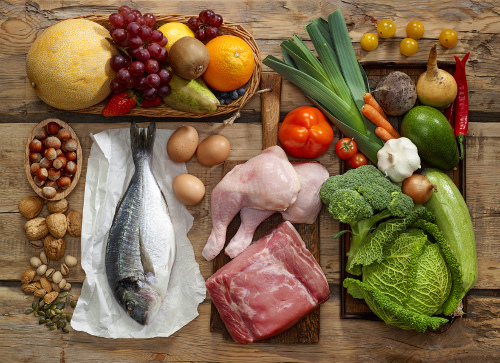 What is the Paleo diet? In 2002, Dr. Loren Cordain marketed the Paleo diet to mainstream culture as a weight loss diet with an emphasis on treating and preventing disease. Cordain researched the diets of our Paleolithic ancestors extensively. The Paleo concept is associated with eating what a hunter and gather would have eaten during the Paleolithic time period. Basically, it is not considered a created diet, but one revealed by science. Other variations of the Paleo diet to since hit the market include the Ancestral Diet, the Caveman Diet, the Primal Diet, or the Hunter Gatherer Diet. All of these are basically the same, with some slight tweaks. What would our ancestors eat? That likely depends on the geographical location of the particular population. For the most part, the diet includes vegetables and meat, maybe some fruit and berries during the warmer months, and nuts and seeds whenever available. The diet avoids all grains and dairy because these foods were not readily available to our ancestors. What’s Included on the Paleo Diet? Lean meats, poultry, fish, eggs, non-starchy vegetables, sweet vegetables and tubers, nuts and seeds, moderate fruit consumption, and healthy fats like olive oil, coconut oil, and avocado. Dairy, grains, beans and legumes, certain vegetables like corn, and processed foods. Some people in the Paleo diet community recommend eating a lot of pork and shrimp. However, pork may carry parasites, and should be avoided. Shrimp are considered bottom feeders, and research shows it is the most toxic of all sea animals. Some on the Paleo diet will also consume too much meat, and the diet advocates don’t always emphasize organic meats and produce, although some do. Basically, some people on the diet will still consume fried bacon and conventional butter instead of the grass-fed variety. The Paleo diet represents as a long-term diet plan. On the other hand, the ketogenic diet and getting most of your calories just from fat is only sustainable short term. When you break it down from a food perspective, both diets avoid processed foods and grains, but the Paleo diet will also eliminate dairy. Keto also avoids fruit and sweet vegetables and tubers, whereas Paleo includes some of each. Both diets include non-starchy vegetables, meats, poultry, fish, healthy fats, and some nuts and seeds. What else is different? The ketogenic diet basically focuses on the manipulation of fats, proteins, and carbs, and fitting within that system of eating. The Paleo diet on the other hand is more about healthy food choices, and have a greater balance of the macronutrients. How Do the Proteins Compare? In general, the proteins are similar, but the Paleo diet is considerably stricter when it comes to plant-based protein, and peanuts, lentils, beans, and other legumes are discouraged. The ketogenic diet is extremely high in fat and allows vegetable oils and dairy products like butter, ghee, cream, cream cheese, and hard cheeses. The dairy and fats should not be hydrogenated like margarine. Today, plenty of information reveals the harmful effects of certain vegetable oils like canola, soybean, and corn oils. The Paleo diet also avoids these oils, and puts a greater emphasis on plant-based fats like olives, coconuts, and avocado. Also, most Paleo advocates choose grass-fed animal products, where this detail may not be true for keto followers. Although both diets focus on getting protein and fat as the main energy source, the Paleo diet will still allow lots of carbs from sweet potatoes, potatoes, carrots, and other root and tuber vegetables. These starchy vegetables are avoided on the keto plan. The ketogenic diet discourages nearly all fruit because it is a source of sugar and contains glucose and fructose. Both contribute to weight gain and insulin resistance. The exception is some berries that also contain lots of antioxidants to balance out the sugar content. The Paleo plan supports fruit, including apples, lemons, pears, and berries. Is Dairy Included? Yes. Full-fat dairy is a fat source that minimizes carbs. No. Most Paleo plans avoid it as it often causes inflammation and other health problems. Is Tofu Included? Yes. It is included due to low carb content. No. Soy is thought to cause inflammation and other health issues, especially when consumed in large amounts. Are Sweet Potatoes Included? No. Sweet potatoes are high in carbs and therefore avoided. Yes. They don’t largely irritate the gut, are generally free of toxins, and are full of nutrients. Is Fruit Allowed? No. Fruit is high in sugar, and highly discouraged from the diet. Only fruit permitted includes high-antioxidant berries (blueberries). Yes. Some fruit is included, but intake should be limited. Some good choices include apples, pears, pears, lemons, limes, and berries. Paleo or Keto: Which Diet is Best? Based on the breakdown of each diet, which one is better to follow: the Paleo diet or ketogenic diet? Honestly, both have their health benefits; however, both have certain limitations or restrictions. Various modifications and healthier add-ons can also reduce blood sugar, burn bat, and prevent and treat disease. Healthy fats: These can include avocado, coconut or coconut oil, flaxseeds or chia seeds, and sprouted nuts and seeds. Protein: Aim for organic free-range grass-fed meat, poultry, and eggs; wild-caught fish; and if tolerated, pastured raw and grass-fed dairy products like kefir. Vegetables and fruit: Consume lots of vegetables like cruciferous and dark green veggies, some fruit, and lots of fresh herbs like basil, oregano, and thyme. To limit pesticide exposure follow the Dirty Dozen and Clean 15 lists compiled from the Environmental Working Group (EWG). Sanfilippo, D., Practical Paleo: A Customized Approach to Health and a Whole Foods Lifestyle (USA: Victory Belt Publishing Inc., 2012), 27-30. “Paleo VS Keto Diet: What’s the Difference?” Open Sky Fitness; http://openskyfitness.com/paleo-vs-keto-diet-whats-the-difference/, last accessed March 22, 2017. “Why I DON’T Eat a Paleo Diet…But Close,” Dr. Axe; https://draxe.com/why-i-dont-eat-a-paleo-diet-but-close/, last accessed March 22, 2017. “Paleo vs. Vegan Diet – the Pros and Cons,” Dr. Axe; https://draxe.com/paleo-vs-vegan-diet/, last accessed March 22, 2017. “The Ketogenic Diet Boosts Fat Loss & Fights Disease,” Dr. Axe; https://draxe.com/truth-about-the-controversial-ketogenic-diet/, last accessed March 22, 2017. “Switching from Low-Carb or Keto to Paleo,” PaleoLeap; https://paleoleap.com/switching-low-carb-keto-paleo/, last accessed March 22, 2017. Williamson, B., “Three MAJOR differences between the Ketogenic and Paleo diets,” Keto Vangelist; https://www.ketovangelist.com/three-major-differences-between-the-ketogenic-and-paleo-diets/, last accessed March 22, 2017. Weeks, C., “Ketogenic Diet vs. Paleo Diet: How They Differ,” Grass Fed Girl, May 18, 2016; http://www.grassfedgirl.com/ketogenic-diet-vs-paleo-diet-how-they-differ/.